Recently purchased, this well maintained condo is new to the rental market for 2017. Incredible Chattahoochee River views from the spacious top floor covered porch and only a short walk to the heart of downtown, this is an ideal Helen getaway. The king size bedroom has a see-though gas-log fireplace, flat screen TV and door that leads out to the large fully- furnished outdoor covered deck. Large bathroom includes a jetted tub, a separate shower and a linen closet for extra storage. Being a top floor unit awards the best views of the river and also assures a very quiet stay. This spacious 980 square feet condo is tastefully decorated with comfortable leather couch and loveseat, Flat screen TV, Gas Fireplace (winter months) all new artwork and accessories. The well equipped kitchen has granite counter tops, stainless steel appliances, and a pub style table and chairs. Washer and dryer also in the unit. We grew up in Georgia and South Carolina. We have a 4 year old son who loves the candy shops on Main Street and an anxious grandpa who is looking forward to teaching him to trout fish behind our unit. We love quiet getaways to Helen and times when we meet up with family and friends. There's always something fun to do. Having grown up in the Atlanta area, we have fond memories of Helen visits as children and young adults. Helen offers beauty and activities year-round; Winter Christmas décor and shopping, Spring flowers and strolls around local parks, Summer balloon festival and water fun, and Fall is all things Octoberfest. 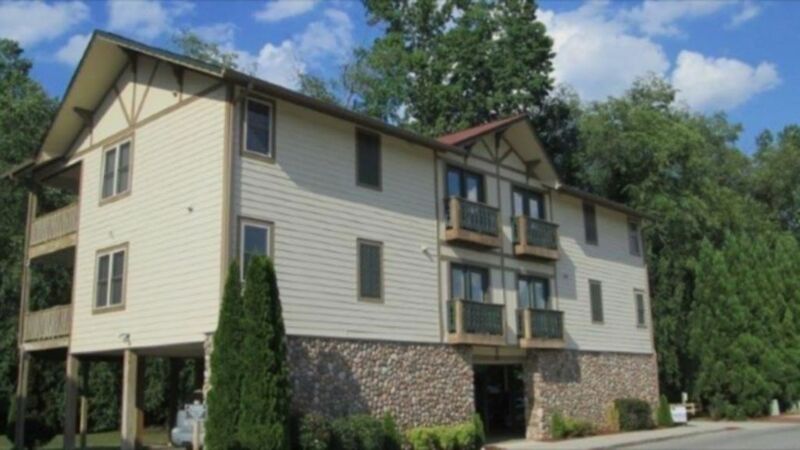 The riverside condo on Edelweiss is a top unit with beautiful Chattahoochee River views. This along with a easy, quick walk to the heart of Helen, made this unit our top pick to purchase. The covered back porch overlooking the river is spacious and private to enjoy a relaxing drink or dine outside. Inside is modern and comfortable featuring a well- equipped kitchen, king size bed, bathroom with large separate shower and soaking tub, leather sofa and love seat, and a gas fireplace to add ambiance from the bedroom and living room during winter time only. The condo association owned all the land between the condo and the river. Easy access to the river for fishing or swimming. We spent 3 nights here and couldnt ask for better. The condo was absolutely spotless. Everything is nice and clean. Linens were soft and kitchen was stocked with most everything you need. They were even kind enough to have all the makings for coffee the next morning. Check in and out was easy and everything was well communicated. We will definitely want to stay here again! We had a great weekend getaway here. The condo was beautifully decorated and CLEAN! I felt at home here. One of the best I’ve ever rented!!! While the photo's are accurate, it is even better in person. The view of the river is beautiful. It was too cold to spend too much time on the deck but we enjoyed the time we did. The fireplace will keep you toasty warm. The owners responded very quickly to any questions. The check in is a breeze. Convenient location close to everything in Helen.I would definitely recommend this clean, comfortable, tastefully decorated home away from home to anyone looking for a great place to stay in Helen. Thank you Lisa and Rich. Perfect getaway location and accommodations! My husband and I loved staying at this property. The owners were very accommodating and easy to work with, as our flight was delayed and we ended up checking in much later than anticipated. The condo was super clean, cozy, super comfortable and simply perfect. We loved the riverside view from the back balcony and the central location made it easy to walk around town. We absolutely enjoyed our stay and look forward to returning in the future. Weekend trip to Helen to visit with friends stayin' just up the street - This one was much nicer for about the same price they paid for a 1 bedroom. Property is well located in town & the view of the river is lovely- Loved this spot & the property- only issue that kept it from being 5 stars was the elevator was out- the load in & out was the only time we really missed it. There was an issue with the pilot light on the fireplace and owner addressed it quickly- It did go out again on our last nite- but it was well past bedtime. Thank you for the review and we hope you return soon! Unfortunately the elevator is out of our control. The president of our association is working to finish the inspections and get the elevator back on line asap. We appreciate you staying at our condo and apologize for the inconvenience. We are happy to say we couldn't have asked for more!! We felt right at home in this beautiful place!! We wanted to bring in a truck and take it home!!!! It was decorated beautifully and the furniture was super comfortable, from the reclining sofa to the bed!! The location is perfect for visiting downtown Helen, as well as being peaceful with a lovely view of, and access to, the Chattahoochee. There is no need to spend a lot at the restaurants because the kitchen is fully stocked. Should we return to Helen in the future, we will certainly book another stay in this wonderful place!!! Thanks Rich!! Call or text 803-727-9511 or email for weekly rates. Thanks you!